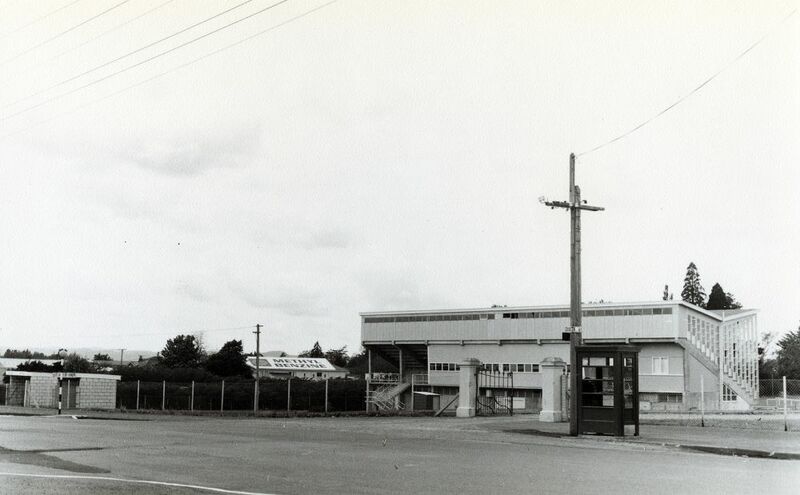 The grandstand at Cameron and Soldiers’ Memorial Park in 1969, taken from Dixon Street. The park became Masterton’s main rugby ground and was usually shortened to Memorial Park. The Masterton public preferred a traditional war memorial so the park did not become the main World War One memorial. In 1943 it became a military camp for the US Marines and, later, the N.Z. Army. A new grandstand was built in the 1960s. In 2008, a naming rights deal allowed the park to be known as ‘Trust House Memorial Park’.